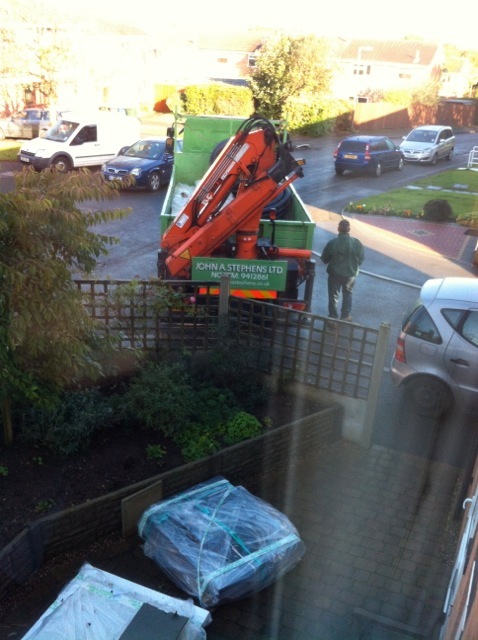 17 October 2012: [Extension] John A Stephens' delivery truck turned up early in the morning, bringing 200 fibre-cement slates. I took it as a cue to get on with the slating. Ive had the battens in the front garden for about 2 weeks, and had a day off, so decided to focus on that. I have other bits in stock, such as disk-rivets and plenty of screws. 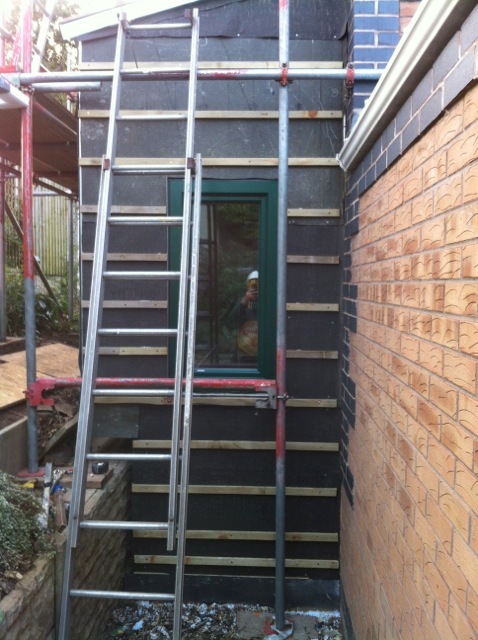 The extension is a complex shape, despite its smallness and I don't feel that I can entrust it to a general roofer - who would find the corner and edge details more difficult than anything they normally have to do. 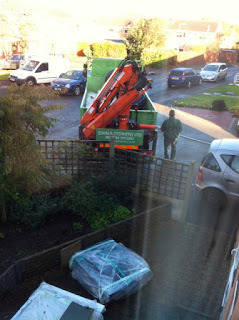 Stephens' lorry just dropped off the 200 slates in the front garden. This demands action! I've worried about the corner detail for a long time, but once I get going, I soon invent the perfect solution. It is difficult to imagine how it will be in a few years time if I want to make it detachable, but this detail will work. The aluminium edge, seen in closer detail. I try to use offcuts from previous work as much as possible, hence the additional drilled holes that have nothing in them. The aluminium edge component fits! Therefore it will be my model for the remaining corners as I work my way around. One problem that I may come to regret is that I don't have maintenance access to the cavity, except perhaps with a very long stick. 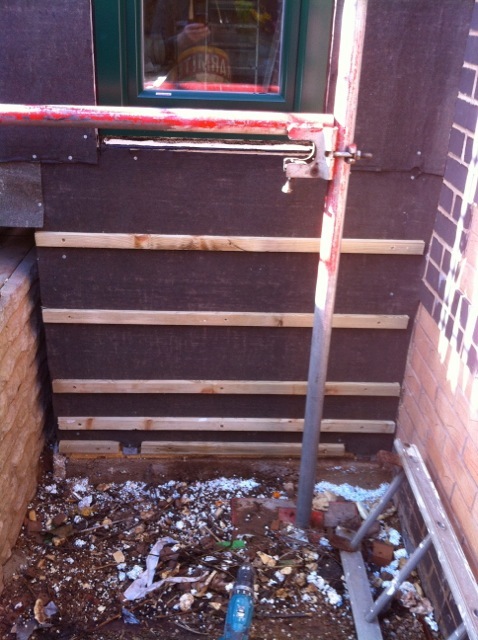 Let's hope that nothing wanders in there and wants rescuing. 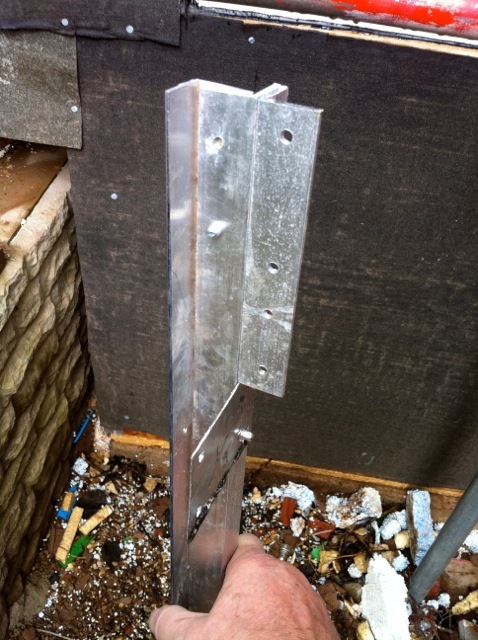 I took my spacing from the Marley Eternit pdf online fixing guide, which would be the first batten, then 100mm, then 150mm, then 250mm thereafter. That was a BIG mistake. 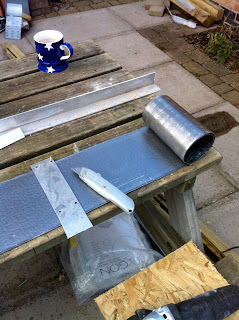 It's ideal for an eaves, but I should have sat down and done a drawing for how it would work when used with walling. It does work, but to get a good ground detail, I had much more cutting than I would want. 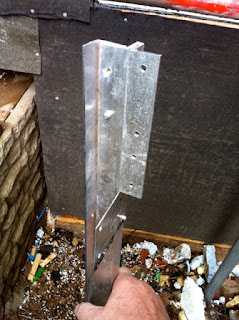 Having spend a very long time sorting out the methodology on the east side, it was comparatively quicker to do it on the west end, and I managed to avoid drilling into any nylon bolt heads. 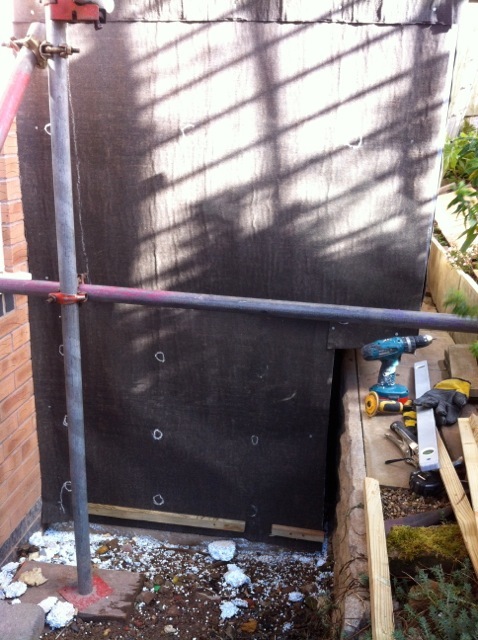 I had to use the same spacing as on the east wall, so will have more slate cutting to do. 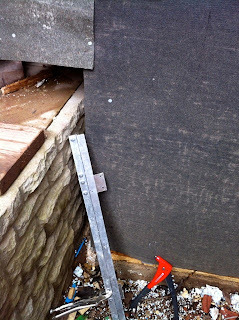 At the lowest slate line, there is also a short section of lead flashing that is tucked behind the slate and comes down to ground. 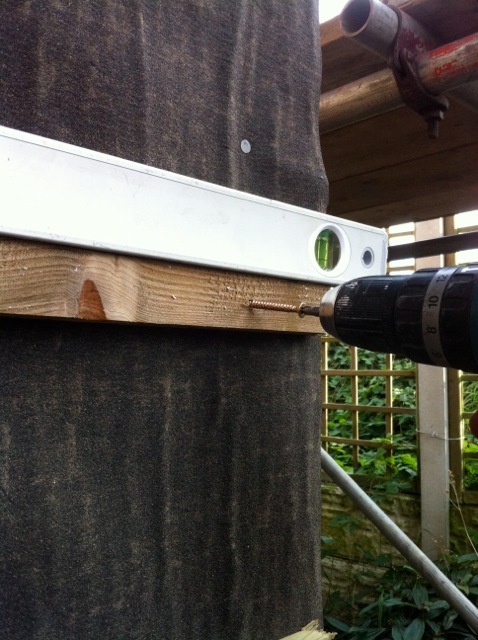 Every single batten is carefully spaced and once one guide screw has gone in, the remaining screw positions are determined by using a spirit level. 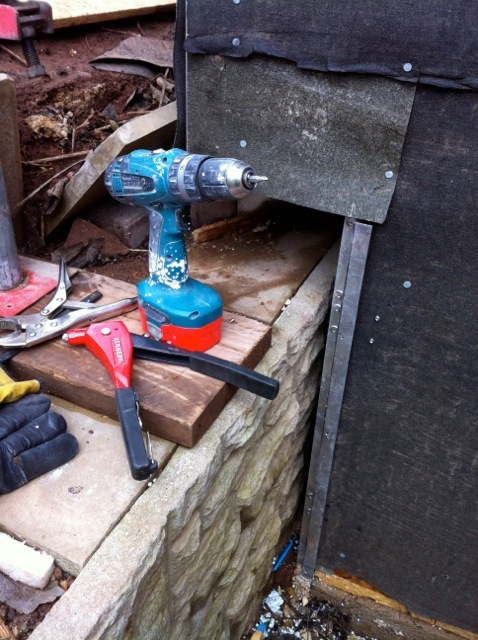 Thank Makita for providing the drilling power, and Turbogold for such excellent self drilling screws! The west wall continues being done until I run out of battens. The east wall has the small window in it. 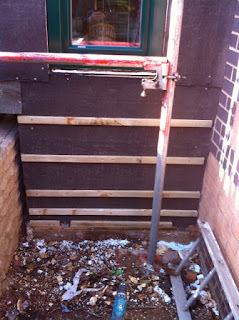 There is hardly any waste because the bits either side of the window use up most of my offcuts from earlier cutting. The window edge will have a nice aluminium trim. Now I start work on the actual slating, but because of my batten spacing, there is more adaptation and cutting required than I expected.A long-life masonry disc-blade is a blessing when attempting all this cutting. Later, the sky got dark, night came, and I have no later photos. They will be added when there is some daylight for photography. I managed to get the first courses of slate in place, with a lot of on-site decision making. Once you are in the middle, it is plain sailing, but in the first stage, the making of the eaves detail takes longer than I expected. 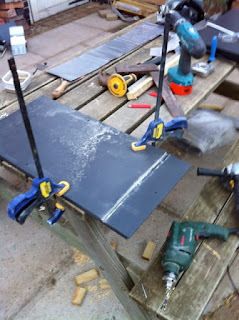 This is my first ever time slating, by the way. 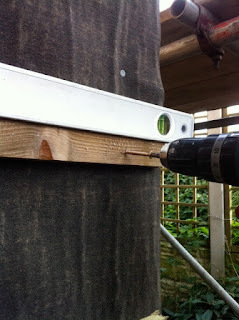 Later in the evening, using my night-time headlamp, I did some more plasterboard cutting. 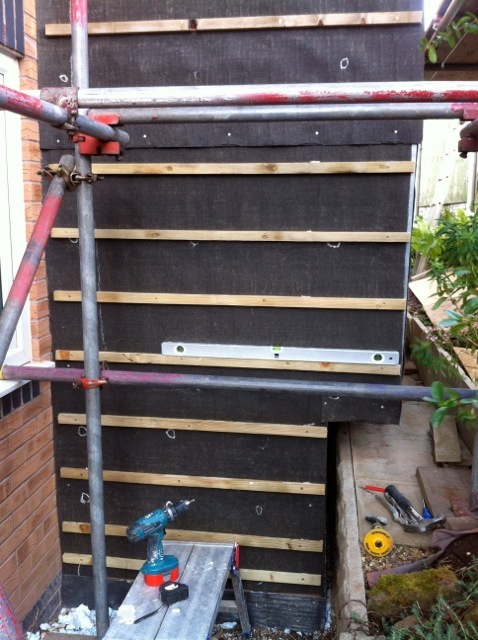 I did not glue them up - they are lightly tacked into place with screws, and there will be a big 'glue-up' later in the week - doing it all in one go so that all the mess is contained in one operation.